Playing the ghosts of the radio towers with radio waves. Image projected to accompany the contact microphone recordings of that tower. Audio samples sourced from my contact mic recordings of the radio towers and associated video projections. “pulse” refers to the soft vibrations of the towers that I recorded, almost like slow echoey heartbeats that have now stopped beating, while “decay” refers to the fact that the the pulse (presence and memory of the site) has decayed, it is now a mere echo, growing fainter and fainter every day. § Audio: Instead of a 12 note musical scale, I work with a 13 “note” scale – 1 “note” per tower. I have dozens of hours of haunting recordings made by placing my home-made contact mics (both piezo disks and piezo film) on the towers and wires. Most of these samples range from 5-15 minutes each. 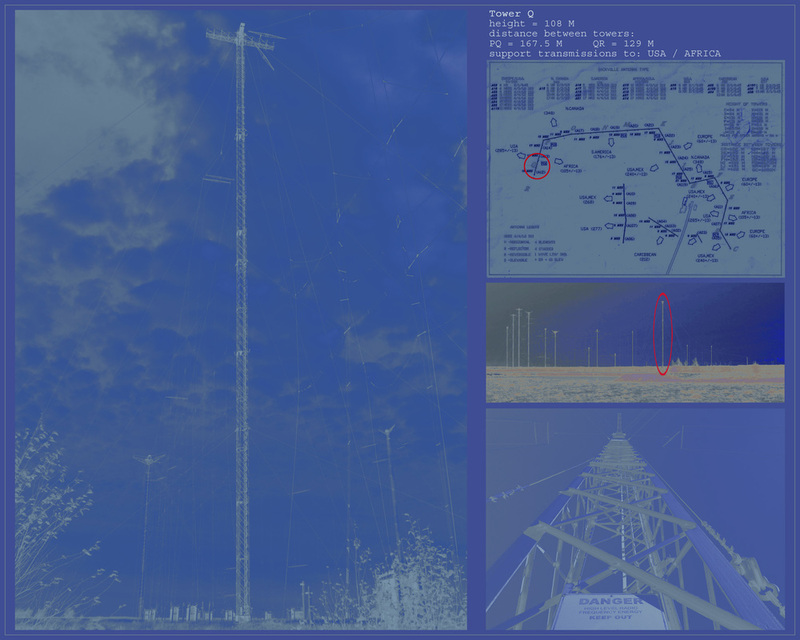 § Image: Each audio sample of a tower is paired with a visual image of that tower. During my time at the site, I did a series of “portraits” of each tower (each one has taken on a personality for me now). Most people who photograph or draw the towers, do so in a landscape fashion capturing all of them and their webbing on the marsh, however I wanted to create an individual portrait for each one, singling them out from the group. The images for this performance are composites: a vertical portrait of the tower on the left, with statistical information of the tower’s name, height, and other info in the upper right, and an aerial map of the site with that tower circled in the middle right, and a landscape view of the whole site with that tower circled on the lower right.